While France desperately wants to complete the two amphibious warships — and get paid for them — NATO and Canada need the capabilities these ships can provide. For Canada, an LPH would help buttress logistic support for the upcoming Canadian Joint Support Ship (JSS). The replacement to Canada’s fleet oilers originally required a level of expeditionary capabilities which were ultimately not included in the final ship design. Furthermore, while one of the Russian Mistrals is already undertaking sea trials and the second is scheduled for completion in 2016, the first of three new Queenston-class JSS for the RCN will not even begin building in Vancouver until 2017 or 2018 at best, with delivery by 2019 or 2020. Yes, there are potential pitfalls that could render this proposal impossible. First is cost. The contract with Russia reportedly runs to $1.76 billion, broken down as $926 million for the first ship and $836 million for the second. NATO member states would have to come up with the cash on the same schedule called for in the Russian contract. Additional costs are associated with outfitting to NATO- standards, base infrastructure and entry into service, including assembling and training multinational crews. 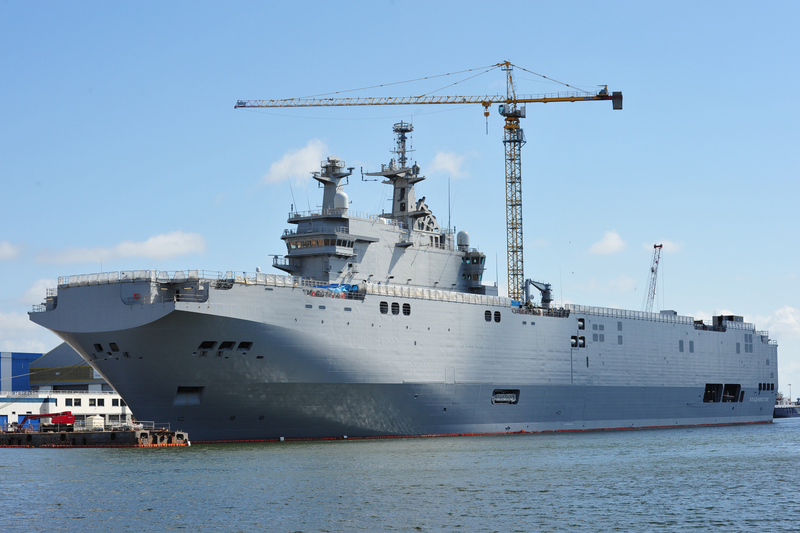 After transferring ownership of the program to NATO, the first Mistral building for Russia, now completing at the STX Europe shipyards in Saint-Nazaire, France, would enter Alliance service on schedule in 2015, based in Europe and manned by a French-heavy multinational crew representing most member states. The second Russian Mistral — slated for delivery in 2016 — would be operated by the RCN on a renewable five-year lease, based on the East Coast at Halifax. Under terms of the lease, this LPH would share commitments between NATO and Canadian national taskings. The NATO Mistral would operate according to proven operational and management models employed by the NATO AWACS force and the NATO Heavy Airlift Wing (HAW) equipped with C- 17 Globemaster III heavy airlifters. Mission tasking and program management would fall to a specified element within NATO HQ. In fact, this may be the appropriate time to place all three of these Alliance-operated assets under a single ‘Critical Enabler’ authority in Brussels. Taking these ships into NATO service would strengthen exactly the multinational rapid reaction areas stressed by the Readiness Action Plan (RAP) that emerged from the NATO Summit in Wales on Sept. 5. The RAP stresses new rapid reaction and reinforcement capabilities in the form of rotational troop deployments; air, maritime and land forces operations and exercises; and the establishment of pre- positioned assets and new military infrastructure in eastern and southern frontier areas. In announcing these measures, NATO Secretary General Anders Fogh Rasmussen highlighted not just the conflict in Ukraine, but also growing instability and the rise of extremism in the Middle East and across North and West Africa that directly threaten the security of member states. The same NATO body that manages the Alliance LPH would manage NATO missions for the RCN ship, with Canada retaining control over national tasking. Commanded and manned by RCN personnel, the ship’s company should initially include a French Navy core team familiar with the vessel and key NATO exchange officers and petty officers from member states like the UK, Germany, Denmark, Norway and the US. Training and Engagement – serving as the RCN training ship; and as a platform for regional engagement missions, embarking training teams and equipment for cruises tailored to the training needs of friendly forces in areas such as the Caribbean, Central America and West Africa. Transport of vehicles, aircraft, equipment, containers and personnel in support of global deployments. The Mistral LPH design incorporates a well deck for transporting and launching up to four landing craft; a flight deck and hanger for more than 16 helicopters; a vehicle deck for up to 60 vehicles, including Main Battle Tanks; troop berthing for 450-900; a Role 3 hospital; and the comprehensive Command, Control, Communications and Intelligence (C3I) systems and spaces required to support a joint force headquarters. A RCN Mistral could operate the full range Canadian helicopters, including CH-148 Cyclones and CH-147F Chinooks. Ideally, Canada should obtain 6-8 additional Cyclones configured for the Commando Helicopter role as part of a financial settlement with Sikorsky over the Maritime Helicopter Program (MHP). Commando Cyclones would be optimized for Special Operations, tactical assault, medical evacuation and utility missions, with troop seats in place of maritime sensors, though retaining the CH-148’s FLIR system. The make-up of a Tailored Air Group (TAG) for the RCN LPH would depend on the mission. A mix of Commando Cyclones, Griffons and Chinooks for amphibious, SOF, Arctic support and humanitarian operations. Cyclones for maritime security and ASW task forces. Exchange aircrew from the US Marine Corps, the Royal Navy Commando Helicopter Force and the Royal Danish and Norwegian Air Forces should be embedded within the Cyclone squadron forming the core of the TAG. This is critical for building expertise and interoperability among Arctic and NATO partners. By way of building a more direct partnership, Resolute could regularly embark RDAF EH-101 Merlin tactical helicopters and MH-60S Seahawk maritime helicopters. Not least of the challenges facing the RCN would be manning. Fortunately, Mistral was designed from the beginning to operate with a small crew – just 20 officers, 80 petty officers and 60 sailors. The foremost challenge for Canada may be convincing the government and the public that obtaining a Mistral LPH for the RCN is sensible and affordable, despite being outside the NSPS construct. Given the challenges now emerging for NATO member states and for Canada itself, the answer is surely a resounding ‘Yes’. The Queenston-class Joint Support Ships that will eventually be built in Canada are still urgently required for their primary role of underway replenishment, but a RCN Mistral in service as soon as 2016 would provide the ability to support a wide range of NATO and Canadian expeditionary and contingency operations. Of course, President François Hollande may well decide to proceed with the sale of these two dynamic warships to Russia once “peace” is restored to Ukraine, thereby making this proposal a dead letter. For the larger benefit of NATO, Canada and France let’s hope not. Jim Dorschner is a Special Correspondent for IHS Jane’s and the Shephard Media Group. He is a retired U.S. Army Lieutenant Colonel with 24 years of service roughly divided between aerial ISR operations and, from 1991, service as an intelligence officer with Army Special Forces and a Joint Special Operations Command component.